Mystery Case Files: Ravenhearst is an hidden-object adventure-puzzle casual game developed by Big Fish Studios, and distributed by Big Fish Games. Mystery Case Files: Ravenhearst is the third installment in the Mystery Case Files (MCF) casual game series, which available exclusively at Big Fish Games website. 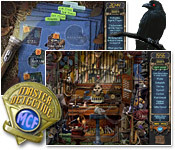 Mystery Case Files: Huntsville is an example of other game in the MCF series. MCF: Ravenhearst has its plot around rumors surrounding the history of stately Ravenhearst Manor have circulated for decades. The recently acquired diary of Emma Ravenhearst may hold the key to unraveling the tale behind this unsettling place, yet the pages are missing. Players assume the role of Master Detective to unlock secrets held within Ravenhearst, scouring a myriad of enchanting rooms in the manor for cleverly hidden clues. Locating and assembling diary pages helps tell the story of the house and, ultimately, unlock the mystery. The full version game of Mystery Case Files: Ravenhearst normally costs only $6.99 to purchase, but nothing beats free, without payment or credit card details required. To get the free game of MCF: Ravenhearst, just visit the Mystery Case Files: Ravenhearst office page (aff). Then, click on “Buy Now” button, and enter the following coupon code, follow by clicking on “Apply Code”, which will make the game free at $0.00. Then, continue to complete the checkout process by registering a new Big Fish Games (aff) account or login to existing account. Users can then install and play the Mystery Case Files: Ravenhearst without restriction and no locked features.